This November, more than 1,200 candidates will compete for nearly 500 Senate and House seats across the United States in the midterm elections. We’re working to ensure that local reporters have the best data possible from Google to analyze what voters care about this election—in fact, this is the first ever midterm cycle that we’ve had real-time Google Trends data available. This data isn’t about voting intentions, but it does provide unique insights into what people care about at a granular local level. Local reporting is key for audiences to make informed decisions about elections, so the Google News Lab team (part of the Google News Initiative) has been working with news outlets to make anonymized Trends data available for their region's top searched issues, related searches and questions. In Ohio, Cleveland.com has used the data to create a whole section on their site that's devoted to stories they have told using Google Search data, including how interest in healthcare as a political issue has grown over time. We’ve also partnered with the Society of Professional Journalists Training Program to lead workshops to help local reporters get ready for election day. The trainings are free and open to all reporters with registration still open for sessions across the country. To make it easier for reporters to find state-level data, we’re launching Google Trends midterm pages, which include county-level data on the top issues searched in each region such as the economy, healthcare and immigration (to name a few). For election reporters based in the U.S., it’s one way to find out what their readers care about through real-time search data. All the charts from the Google Trends midterm pages are embeddable on any site and will continue to update even after they’re placed on your site. 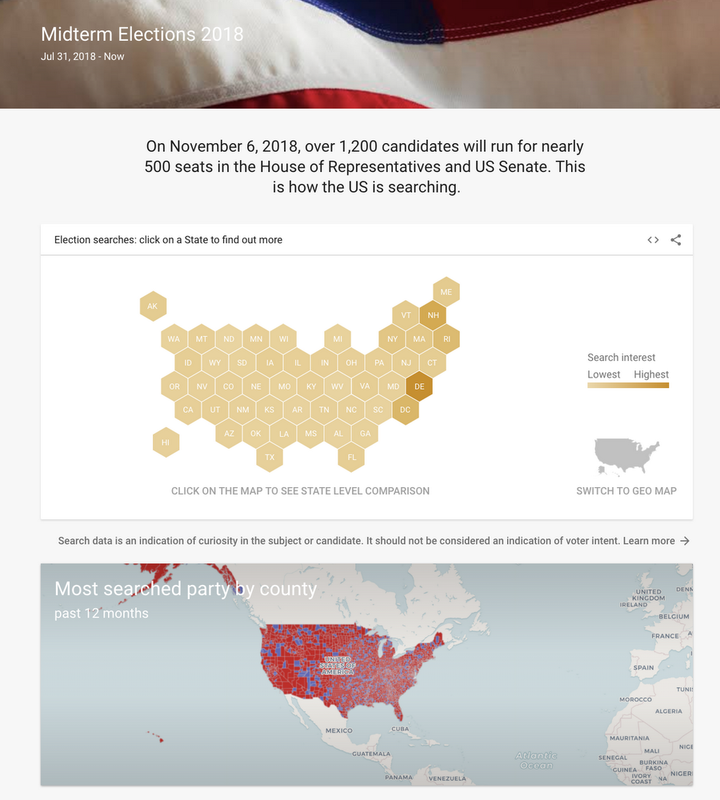 In addition to the midterm pages, the Election Databot (built with ProPublica), combines all the key data you need to tell local election stories, such as the latest Google Trends data, candidate spending data, campaign ads, deleted Tweets and campaign statements. As of today, the Databot has a new front page including new maps and summary data to make it easier to tell ultra-local election stories. The Databot sends notifications whenever there’s new data for specific races, and it’s used by news outlets across the political spectrum and by Congressional candidates from both Republican and Democratic parties. If you want to map any kind of election data, we’ve got you. 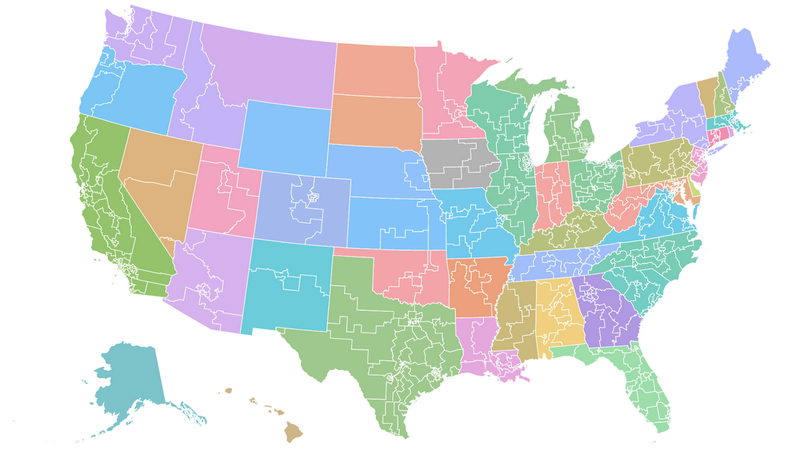 For making local cartograms, maps that represent data differently than regular maps like the one below, we’ve updated our Tilegrams tool to include congressional district boundaries for every state in the country. Those maps can then be downloaded as either interactive or editable files to be used on the page. If you prefer a regular-shaped map, we’ve added a congressional districts map as a visualization anyone can use in Flourish, a Google-supported tool to create easy to use visual templates for all reporters. As the midterms get closer, local reporters will play a key role in telling local stories to audiences desperate to understand the latest twist in each race. We can’t wait to see what you do with the data and tools here. And if you want to work with us on a project, just contact as at newslabtrends@google.com. Beyond the elections, you can explore Google Trends at google.com/trends and learn more about the Google News Initiative at g.co/newsinitiative.